Do you have fast fingers and enjoy a watery blast? Do you have a passion for competition? 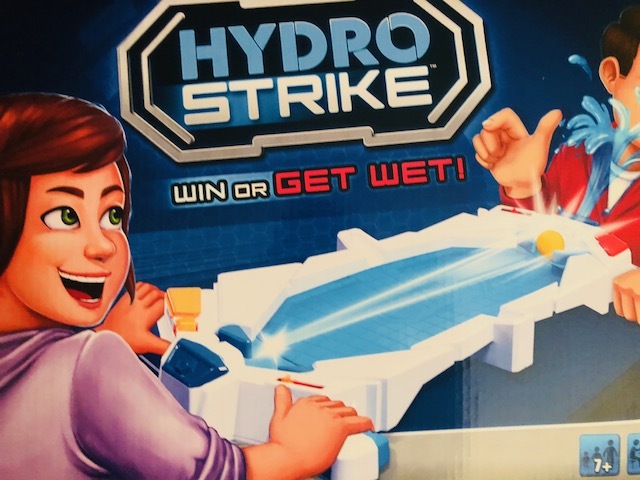 Then Hydro Strike from Pressman Toy is the game for you! Hydro Strike originally made its debut in the 80s and has made a brand new come back for the holiday season in 2018. The game is played with two players (it is recommended for ages seven and up but I think an advanced motor skills child at the age of five would love it) where the goal of the game is to be the first person to score five goals. Participants use the pinball like pieces on the bottom of each side of the game to shoot the ball at their opponents net. If they score, their opponent gets a splash of water in the face. Our kids LOVED this game. Not only was it full of action and competition, if they scored their brother was squirted with water (the ultimate goal in their minds!). Bear in mind, it isn’t a face full of water (so please don’t be worried about soaked floors and tables) but a small stream that you aren’t expecting and the boys loved it. If by some chance it didn’t go off, they made sure they got each other! 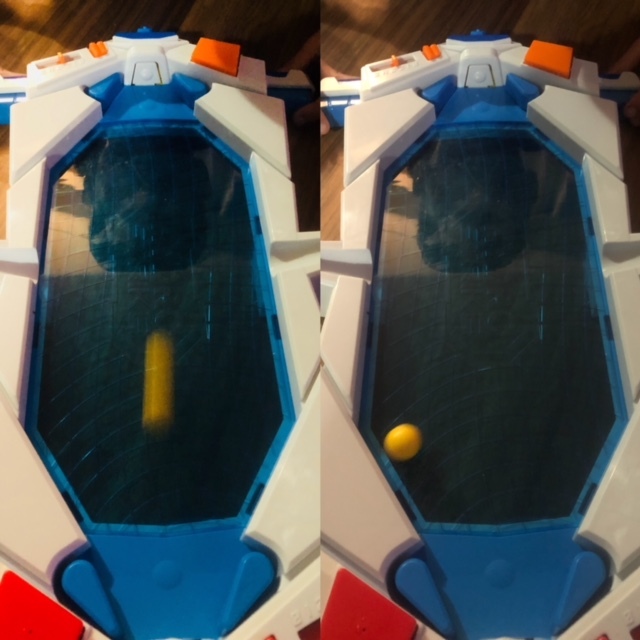 The actual game piece is made of strong plastic with a see through blue middle that almost reminds me of a skating rink. On each end the players have to squeeze the handles in order to shoot the balls in pinball style to the other side. We had the kids play on the floor because they would get super competitive and would shoot the balls so hard that the game (and them) would slide back and forth across the floor. The kids had all of us engaged and laughing with this game, it is hands on and encourages you to talk, laugh and even tease each other. Our dog was even getting involved in the action as she couldn’t figure out what they were doing and loved cleaning up the water on the floor (again it wasn’t a lot, you could easily wipe it up with your sleeve and not have a soaked sleeve). This game was a definite hit with all members of our family, young and old. 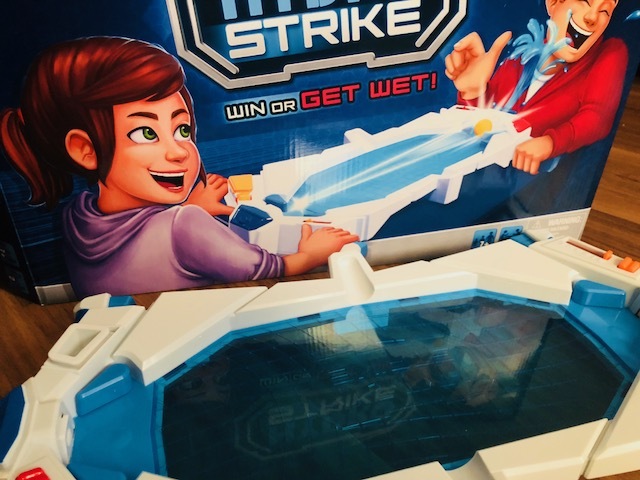 Do you want to learn more about Hydro Strike (and other exciting new games), head over to the Pressman Toys website. Have a child or grandchild that this would be perfect for this holiday season? You can purchase this game at Amazon and Target. Make sure you follow Pressman Toys on Twitter and Facebook to keep up to date with all the newest toys and games. Disclosure: I received the above mentioned game in order to facilitate this review. All opinions expressed are my own.